Marion Linden morphed from a Ohio high school football star in 1932, to a failed felon with a death wish in Nebraska in 1936. His plan to die in a hail of police bullets in Omaha, thereby easing his parent’s Depression era monetary woes, went south faster than a freight train to Georgia. Marion was given a break, three years probation, and didn’t do any prison time for his dangerous and idiotic behavior. Marion wasn’t supposed to leave Nebraska, but that didn’t stop him. He married 18-year-old Arlene Fagor in Denver, Colorado, on December 5, 1936. Marriage can be a maturing experience for some, but evidently not for Marion. His good behavior and his marriage lasted all of two months before ending in gun fire. Marion shot Arlene in the heart when he learned that she had been unfaithful to him while he searched for work in Texas. Found guilty of voluntary manslaughter, Marion was sentenced to from seven to eight years in a Colorado prison. By now may be wondering what Marion’s criminal behavior in Ohio, Nebraska, and Colorado has got to do with Los Angeles. Simple. Like many others before him, following his release from prison the ex-con moved to Los Angeles–land of bright blue skies, sunny beaches and, in Marion’s case, third chances. Prison may have mellowed him, and perhaps it did–for a while. From 1940 to 1957 if he committed any crimes they weren’t serious enough to get his name into the newspapers. Unfortunately, Marion proved to be incapable of keeping his life on track. On Sunday, March 17, 1957, St. Patrick’s Day, Leo Wise, a 34-year-old LAPD officer from University Division, was on his evening rounds when he responded to the shouts of a bartender at a bar at Pico and Figueroa. Wise arrived to find an extremely intoxicated man creating a disturbance. Wise pulled the man onto the sidewalk outside the bar and patted him down, but didn’t find a weapon. Officer Wise said, “I don’t want to see you on the street anymore. Go home.” The patrolman then walked off in one direction and the drunk lurched off in another. After watching Officer Wise depart, the man returned to his spot in front of the bar. When Officer Wise returned later in the evening he found the man where he’d left him. Wise said, “I thought I told you to go home.” He patted the man down and once again he didn’t find a weapon. Because the man hadn’t complied with his suggestion to go home and sleep it off, Officer Wise had no other option but to arrest the scofflaw. Wise walked over to the police call box to request transportation for the man’s trip to the drunk tank–he never saw the pistol. The man shot twice, hitting Wise in the neck and side. The wounded officer fell to the sidewalk but he managed pull out his service revolver. He got off two shots before the man jumped into a car and drove away. A small crowd gathered around the fallen officer to render aid. Wise waved them off and gasped, “Take the number of those plates and call the police!” Officer Wise died of his wounds. Mexican national Luis Alatorre was driving by the bar with three companions. He witnessed the shooting and didn’t hesitate to drive after the suspect. Alatorre and his friends flagged down motorcycle officers, Charles Sturtevant and Lloyd Nelson, who continued the pursuit. They stopped the man at Alvarado and 11th. Alatorre and his companions, who had followed in the motor officers’ wake, pulled up and shouted, “Be careful, he has a gun. He just shot a policeman.” The man yelled at the officers, “you took me, but I got one … I would like to shoot some more, just like I did the last copper. I’ll bet he is dead.” The suspect spat in the face of the officer who was handcuffing him. The suspect was taken to LAPD’s Homicide Division where he was identified as Marion Linden. Lieutenant Gebhart, and several other officers later testified that Linden, even though he was handcuffed, had kicked and spat at officers and knocked furniture about. Lieutenant Gebhart heard Marion say that three years earlier he had been “framed” by two policemen on a charge of interfering with an officer. He insisted that the officers had perjured themselves . He was convicted of the charges and during his 90 days in jail he made up his mind that he was going to kill a cop. 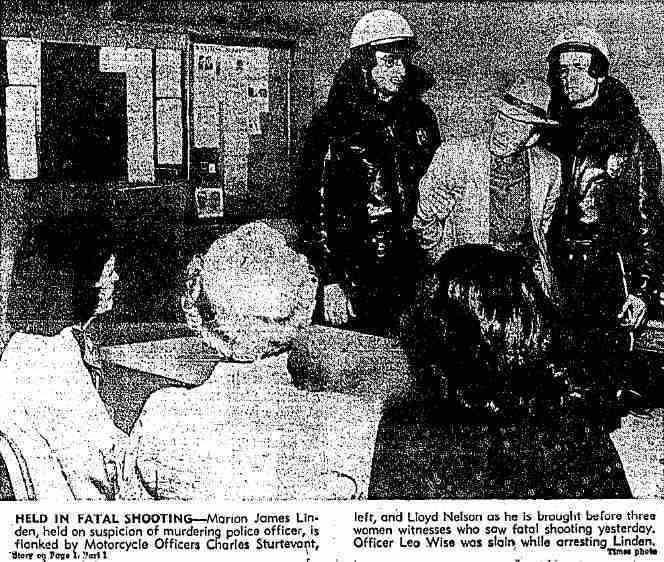 Marion bragged that: “it took the jury eight hours of deliberation on a misdemeanor charge to convict me …I’m very tough to beat.” He also said that he had beaten one other murder rap and he would beat the charges against him for the murder of Leo Wise. Marion was wrong. He was convicted of murder and sentenced to death. Two years later, on July 30, 1959, Lt. Governor Glenn M. Anderson granted Marion a clemency hearing. The hearing came just in time. Marion was scheduled to go to the gas chamber in about a week. Governor Brown told reporters he wouldn’t interfere in the case, and left for a junket in Puerto Rico. Marion’s execution was delayed while he acted in Pro Per and filed his own appeals. A few minor errors were corrected in the trial record but, apart from that, nothing substantive was changed. Marion’s death penalty stood. On January 1, 1960, a fist fight broke out on death row. Marion and several other inmates, including the infamous “Red Light Bandit”, Caryl Chessman, got into an argument in their exercise area as they were about to watch the Rose Bowl game on TV. The fight ended when one of the combatants smashed the television on the floor and guards came in to separate the inmates. The fray was likely instigated by Chessman, but each of the other men saw an opportunity to mix it up and jumped in. They had nothing to lose. Marion’s early life had showed promise, but somewhere along the line he lost his way. He became a violent and bitter man intent on murder. On July 12, 1961 forty-three year-old Marion James Linden paid for his life of crime in California’s gas chamber.